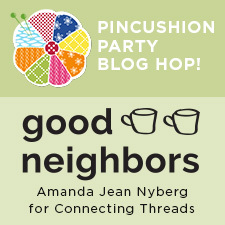 A Quilter's Table: good neighbors :: a pincushion party! A first fabric collection is definitely reason to celebrate, and I'm joining in to give a shout-out to Amanda Jean/Crazy Mom Quilts' as her new collection, Good Neighbors, is now available through Connecting Threads. Amanda Jean is a real encourager, scrap-happy and then some, gathering oodles of us up each week for her finish it up Friday link-up. AND she is an avid pincushion maker and collector so a pincushion party made perfect sense! Her Good Neighbors collection is a colorful and delightful mix, with white thrown into every piece. I chose one of my favorite prints for the top of my pincushion - the "X's". The charcoal makes a great low-volume choice, and I know it'll be making its way into other projects. The little bow-tie blocks are 2" finished, so this is one mega 6" pincushion, quilted in a dense grid. I hand-washed the quilted patchwork to add more texture before continuing on with construction. By continuing on, I mean I was having so much good neighborly fun, I had to make the "bottom" as interesting as the "top", so I make some cross blocks (2 3/4" finished) and matchstick quilted them, again washing before the final step. The Silver Lining "Cross Stitch" print was perfect for the sides, adding just a bit of calm to all that color. And per my norm, I filled my pincushion with crushed walnut shells. Lucky us, as part of my participation in the pincushion party, I'm able to give away a charm pack of the Good Neighbors collection to one of my US or Canadian readers! So if you'd like a chance to win, just leave a comment on this post, and I'll choose a random winner after the weekend. This giveaway has ended. Congratulations to Helen, commenter #21! Meanwhile, enjoy the party and check out these hashtags on Instagram to see more Good Neighbors fun: #goodneighborsfabric and #connectingthreads. 9/9/2015 Vanessa – V and Co. I know are can't win, and I hope it doesn't mess your random number generator up too much, but I just had to tell you how much I love your sweet pincushion! The little bow ties are so sweet! The 'X"s fabric will be a great low volume addition too! Your cushion is fabulous!! thank you! I think I like the backside of your pincushion best, but the front is also great! Your pincushion is adorable! I love the quilting and the extra large size. Thank you for a chance to win this new gorgeous favbric. Everyone needs a monster pin cushion, right next to their trusty machine! It's better if it's made with fun fabric, designed by a friend. And are those scrumptious Tulip pins? I bought some from the Quilting Loft when I last visited Seattle, and alas, that store is now closed. Have fun using the cushie! I absolutely love the pincushion. It is inspiring me to try the pattern and method of quilting and washing before construction. Such an adorable pincushion! I love the idea of washing the top before constructing the pincushion. I'm definitely giving that a try. Thanks for sharing! Really cute. Loving this blog hop. Holy cow! Those little blocks...are...so...dang...cute! I am in love with it! Great job, one of my favorites for sure! I love the tiny blocks and your use of color - the gray is such a nice calming tone with the brights. Your pincushion is ADORABLE! Such tiny pieces! How interesting! Beautiful detail on both top & bottom of pincushion! I love me a big pincushion and this one is awesome from top to bottom! Adding it to my Pinterest board next. Gorgeous fabrics...I already have them pinned, too. Your teeny, tiny patchwork is so amazing! 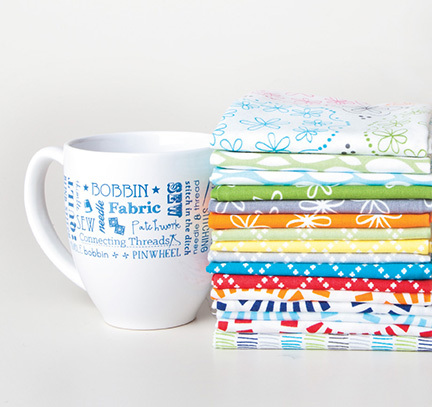 Love your pincushion, and the Good Neighbors fabric! Fantastic pincushion. Those are some really tiny pieces to work with. Those are some teeny blocks. Love both sides. ALL of my pin cushions are big. I use lots of pins. This is wonderful. Great use of some really fun prints. Thanks for the opportunity! Very nice Pincushion! Very tiny piecing! Oh my gosh, oh my gosh, oh my gosh! I LOVE your bowtie pincushion. Sweetness! 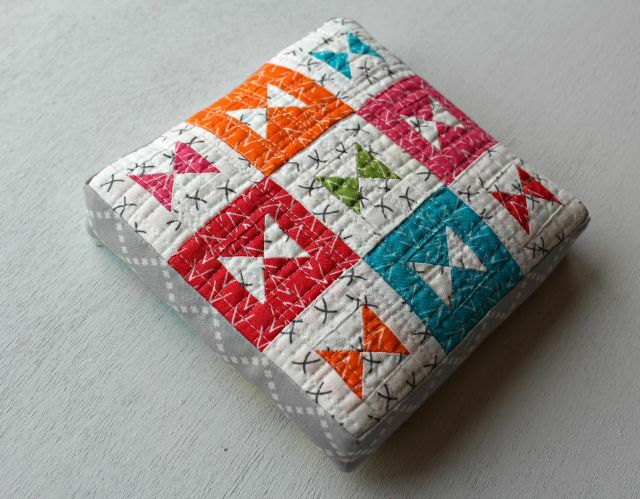 Two tiny quilts in one pincushion -- I love it!! What a great pincushion. If I were flipping it rather than a coin, I'd win no matter what! Your pincushions are darling! I love these fabrics! This is the cutest pincushion ever. I wouldn't know which side to use. That is such an adorable pincushion! The fabrics are amazing first of all, and then your amazing design ideas for those tiny squares! Love the beauty on both top and bottom! Love the two sided pin cushion. I love this fabric and look forward to owning some of my own. Thanks! Nice job. I've enjoyed seeing all of the pincushions made with this fun and colorful fabric. Fun, wonderful 2-sided pin cushion! It's great that Amanda is designing for Connecting Threads. Adore that pinchusion! Thanks for the chance to win! Love the tight quilting on your "mini quilts" and that you washed them to make texture! Cute pincushion and I love that fun, cheery, colourful fabric collection!! Oh! Your designs are adorable! I really like that you made this reversible. And the post-washing makes a difference in the finish. Such a cute design. I have only practical "pin cushions" (AKA store-bought), so all of these are great fun to see. Thanks for the chance to win too! Super cute pin cushion, with super cute fabric! Oh my gosh! I love BOTH SIDES of your pincushion! Awesome job! Such bright cheery fabrics, thanks for the chance to win! Love this fabric line! Your pincushion is really cute. Great job! Love, love your pin cushion! These are so cute. I think its time I try to make one! Loving these fabrics and everyone's pin cushions! Your pin cushion is darling...both sides! I might need to make a new one today, as my wine glass may have tipped over last night and those walnut shells in my pin cushion really soaked up the red wine well! Love both sides!! So cute! So cute! Great idea to wash it and get it all crinkly before assembly. Love that pincushion!! Definitely have to make a 2 sided one in the future. Thanks for the giveaway. I'm greatly enjoying seeing all of the entries in the pincushion parade! Your pincushion is adorable! Such patient stitching! Amanda's "Good Neighbor" collection is so pretty. I love the colors. I would really like to win some, thank you for the chance!!! you're pincushion is fabulous! It's been so much fun seeing what everyone has come up with. I love your pincushion. This fabric line is so cute and versatile. Love it! Your pincushions look great and the fabrics are wonderful! That lovely pinnie could have its own zip code with all the detail and charm you put into it! This is a great collection! I've enjoyed checking out everyone's pin cushions. I love your pincushion. The quilting is beautiful too. Love them ( counts as 2 right ). Great job on showcasing Amanda Jeans fabric line. Sweet! Sweet! Sweet! I think this would also be so adorable in a full size cushion! Love it! Who would have thought to make a reversible pin cushion? Great idea. Love Amanda Jean's fabric line. Inspiring to see such clean work on tiny projects, beautiful! I really love your pin cushion! Such details! Thanks for the giveaway! Looks like everyone's getting pincushions for xmas this year! Hi love the 2sided pin cushion! Thanks for sharing! Your pincushion is so cute. I'll have to try those little bow tie blocks. Neat quilting, too. I guess that is a good sized pincushion! Love it! Amanda Jean's fabrics are beautiful. Thanks for the opportunity to win! Such a cute pincushion. Love your fabric choices. So happy to see Amanda's designs with Connecting Threads. Thank for the chance to win a prize. Loving this hop and your pincushion is adorable. I love your little pin cushions! So cute. Thanks! The bowties are very cute. Great idea to patchwork both bottom and top! I like your idea of having the bottom as decorative as the top, plus the added embroidery is so precious! This fabric collection is so pretty. I'd be so happy to work with it! This is adorable! Love that it is two-sided! Your piecing is adorable! And this is such a cute pincushion in Amanda's fabric. Thanks for sharing it with us. A double-sided pin cushion is a great idea. Oh my gosh, your pincushion is just adorable. LOVE it! And those fabrics I was already checking those out and contemplating buying some. I'd love a charm pack for sure. 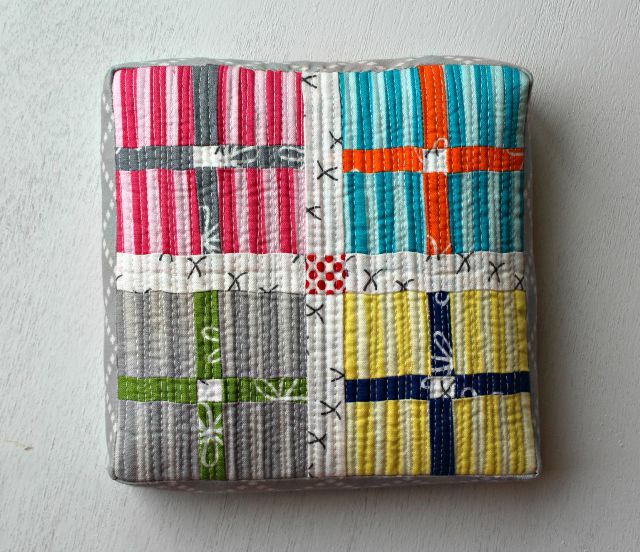 Love your pin cushion, and Amanda Jean's fabric looks great! Both sides are amazing, love the matchstick quilting. I love your little pincushions. I collect and make these so thanks for the inspiration and giveaway. Thanks for the chance to win. Love your pincushion! Such bright colors - I love this fabric line. Once again--sooo cute and useful. I love it! Gone are the days of wool pincushions! Ha! Sooo cute! Thank you for the giveaway. I love the new Good Neighbors fabric! I love the double-sided fun! I love your pincushion. Such cute blocks! I love your pincushion! I really like how you quilted it as well. Fantastic pincushion and fantastic quilting! I love this fabrics and your pincushion is super bright!!! Love the fabrics and your pincushion is fabulous! Love that you made a top and bottom. Sew cute. Love your Good Neighbor pincushion ! You made such a beautiful top and bottom! 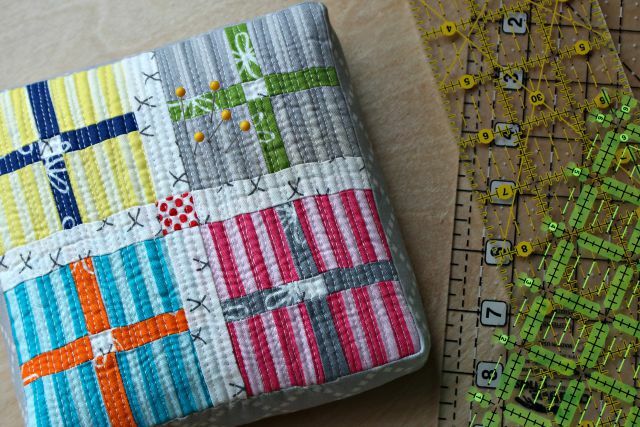 I love that this pincushion is pieced on both sides. Very cute! So cute! Seeing all the lovely pin cushions is making me want to do one. Your Pincushions are delightful! Thanks for sharing the giveaway. I love that you hand washed them before finishing. They look great! Love your pincushion - practical and cute! 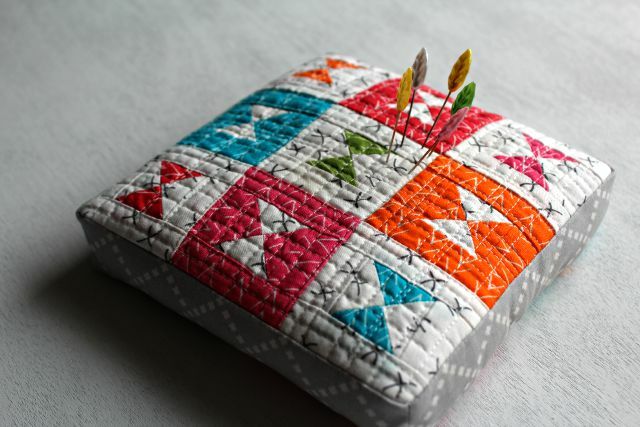 Awesome pincushion - love the matchstick quilting!!! WOW! Great pin cushions. Thanks for the chance to try this fabric line. Love, love,love! Very cute. Thanks for the chance! Love your pin cushion! Would love a chance to win some charm squares of the cheerful Good Neighbors collection! I love that you made your cushion two sided! Thanks for the chance to win! Oh!! What a *great* idea, to wash the quilted parts before final assembly of the pincushion!! I love all your choices... colors, fabrics, patterns... And the washing is a brilliant idea, to bring out the texture of the quilting!! Cute pincushion! Would love to win some Good Neighbors fabric. Thanks for the chance. Love the twosidedness idea! Love this new line also! Thanks! Debbie, Thank you for playing with my new fabric and for being a part of the pincushion party! I am so glad you did! I Love that the pincushion is large and that you match stick quilted it AND made it two-sided. You aren't an overachiever at all, are you?!?!?! :) You did an amazing job...and I love the tip of hand washing the patchwork before you assembled it for added texture. What a great idea! Your pincushion is fabulous. Such detail. Thanks for the chance. Wow! I just love your pincushion. So much tiny detail, it is so fun.